I decided the JLA: Secret Files & Origins ting would work better as a Scanning My Collection article. Expect it later this week. While we’re waiting on that we cut to Paul…sorry, “Boris” and Natasha scoring fake sob stories and Nat antagonizing some poor ice cream shop attendant who just want them to order some ice cream instead of taking up space at the register talking about bears or something. Am I still supposed to feel sorry for her and the whole Kilo business, because she’s basically a horrible person and he isn’t much better. 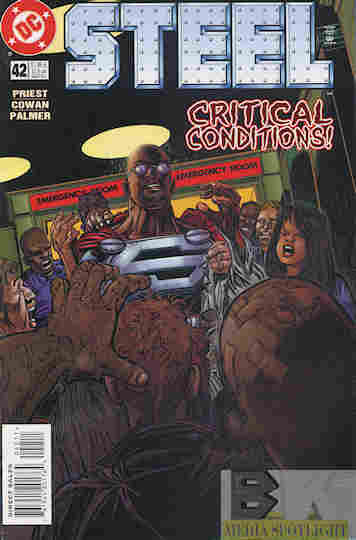 Then the hospital is getting so many people in that the trauma center is closed to take up the room. Amanda helps out, and learns that “Skorpio” is Sam Ellis, one of the other doctors, and she doesn’t turn him in to John because of a “trainwreck of mixed loyalties” and not “right now he’s saving a life and not killing people and it’s an emergency”, not that it matters because the patient dies anyway. Or at least Will-Hane declares him dead so everyone will get to the fundraiser. I don’t care about this love triangle because I don’t care about Amanda Quick at this point. Like at all. The story ends with John helping by bringing a kid his AIDS medication and it turns out to be Paul/Boris and his last name is Tomlinson. This would have potential but I don’t care about his and Nat’s not-relationship anymore than I do John and Amanda’s non-relationship. At one point John wonders if he’s the only sane one in this city. I think he’s at least the only one with any morals. The guy at the check-in desk is a jerk. Amanda’s a jerk. Some of the patients are jerks. Nat and Paul are jerks. Basically everyone is either a jerk or evil except for the suddenly snarky John Irons, who only seems to be doing superhero stuff just to remind us this is allegedly about a superhero. I’ll be honest with you folks: I hate this comic. I expected to be picking up a superhero series and ended up with this soap opera that wouldn’t be out-of-place in a Milestone comic, but that’s why I didn’t get into Milestone comics. But it’s also one more thing: boring! There’s four pages and a panel of superhero stuff, using the amount of comic space I expect out of a minicomic (but that’s the 90s for you), and the rest is love triangles and horrible people. The racist cop bit comes out of nowhere and adds nothing to the story, like most of the commentary I’ve seen in this comic since Priest took over and 90s’s me jumped on for expecting the superhero comic I saw in the random issues I had picked up before this. I cannot in good conscience recommend this issue at all, even with the Skorpio and Paul revelations. This issue represents everything I don’t like about this comic and only a minute of what I had collected this comic to see. I’m pretty sure I dropped it in a few issues from now. Posted by ShadowWing Tronix on July 9, 2018 in DC Spotlight, Yesterday's Comics and tagged Amanda Quick, Natasha Irons, Paul Tomlinson (Boris), Skorpio, Steel (John Henry Irons).